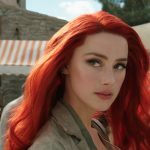 Courtesy of Warner Bros. Pictures & © DC Comics(NEW YORK) — Amber Heard stars as Mera, queen of the sea, alongside Jason Momoa in Aquaman. But when the cameras weren’t rolling, the actress says her time was spent reading — which wasn’t as easy as you might think. Heard told Good Morning America that when she was suspended by wires for the movie’s stunts, it was someone’s sole job to toss her a book to read between takes. The book bag also ensured her books were safe from co-star, and notorious prankster, Jason Momoa. Aquaman — also starring Nicole Kidman, Patrick Wilson, Yahya Abdul-Mateen II, Temura Morrison and Willem Dafoe — opens nationwide December 21.